There’s a certain irony in the fact that when I clicked on the Kellog’s SpecialK Web site tonight to see what I might have missed in its ingredient label, a popup appeared asking me to complete a customer satisfaction survey. Turns out they wanted to know how well the Web page worked for me, not how satisfied I was with the product. Since they weren’t interested in my input then, I’ll put it out here now. Simply put, a Special K Chocolately Drizzle bar made Big Guy very sick Monday. It might have killed him if his teacher hadn’t rushed him to the school nurse after she noticed tell-tale hives march across his face roughly 10 minutes after he ate one. I know the Special K bar was the culprit because it was the only thing he’d eaten that morning. He’d had chocolate milk for breakfast but that had been three hours earlier — well beyond the two-hour window during which allergic reactions occur. Exactly what he reacted to, I’m not sure, but scouring ingredient lists I can find online for other Special K bars, I’m betting it was peanut. In the Special K bar line alone, there’s a honey nut variety that contains peanut. Delve a little more deeply into the Special K lineup and you’ll find peanut in every bar in the Protein Meal and Protein Snacks line. Branch out into the Nutri-Grain family and you’ll see Fruit and Nut bars with peanut. It’s clear to me that something somehow slipped into a Chocolatey Drizzle bar. I get that the folks at Kellogg’s are human and that humans slip. I understand how difficult it is for manufacturers to avoid cross-contamination. That’s why I buy few manufactured foods. It’s probably not even desirable to eliminate it, given how far such an effort would drive up food prices. But I don’t get why a $12 billion company can’t spare the loose change to buy enough ink to add a cross-contamination warning to a product. What is Kellogg’s position on food allergies? At Kellogg Company, we understand and share the concerns expressed by consumers who are affected by food allergies. Kellogg’s has been one of the leaders in the food industry in devising manufacturing processes to reduce the risk of allergens from contaminating allergen-free products. We have worked extensively with allergy organizations, such as The Food Allergy and Anaphylaxis Network and research groups, to communicate allergen information and keep updated on allergen issues. All Kellogg’s USA, cereals and convenience food packages are labeled for potentially allergenic ingredients in a separate box directly below the ingredient list on the Nutrition Facts side panel of each of our products. Because product formulations can change at any time, we encourage persons with food allergies to check the ingredient statement on each package for the most current ingredient information. I did that. There’s nothing that Big Guy’s allergic to included in either the ingredient list or in the Food and Drug Administration-required Big 8 warning. There’s no cross-contamination warning — not that anyone knows what those mean anyway. What does it mean if a product is labeled, “May contain traces of (peanut or tree nuts)”? 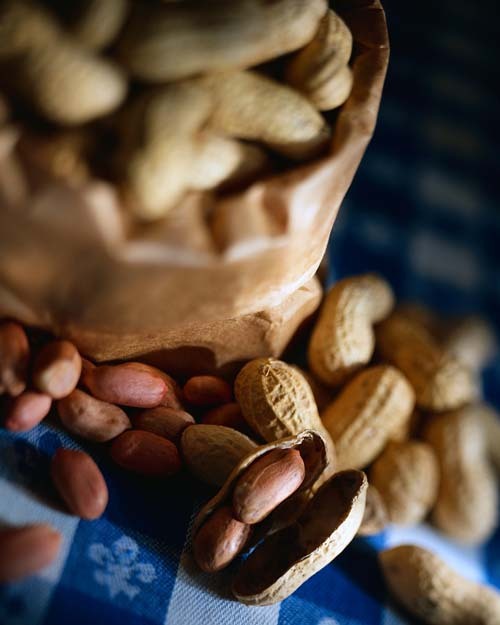 Products that are labeled “may contain” indicate that the product is produced on a line that shares equipment with another product that does contain peanuts or tree nuts. At Kellogg, equipment is thoroughly cleaned between processes, and we follow approved standardized manufacturing practices in all facilities. Obviously someone slipped up twice. There was no “may contain traces” alert. And given what happened to Big Guy, I’m highly skeptical the equipment was “thoroughly” cleaned. Another irony: We switched to Special K in part because Quaker notified the Food Allergy and Anaphylaxis Network back in January that the Mini Delights line Big Guy loved would be produced on a line that processes peanuts. At least Quaker let us know. I’ll continue to buy Quaker products. Kellogg’s is evicted from my kitchen, though. Debra I just found your site and am enjoying reading your posts. I have a daughter who is allergic to eggs and peanuts, thus I feel your pain. I am thankful for the required labeling, but if companies are not honest, it makes our job much more difficult. As for NutraGrain bars, NOT the Fruit and Nut variety, they are a big hit with my girl and me. She is a toddler, thus she is very picky. These guys have come in very handy when I need her to eat something. I don’t think most companies are DIShonest. I do think a lot of them are sloppy, though, because they don’t realize what a serious problem this is. And despite Kellogg’s careful statement on its Web site, clearly word didn’t filter all the way down the production line. My Big Guy is a very picky eater, too, and I swear it’s related to the food allergies. I mean, would you blame him? Food’s been attacking his body since he was 11 months old. I’d be scared, too.